In 1958 Tehran, Nasser-Ali Khan (Mathieu Amalric, The Diving Bell and the Butterfly) is lamenting the destruction of his beloved violin. His wife (Maria de Madeiros, Pulp Fiction) smashed it in a fit of rage. None of the instruments that he buys to replace it, including a Stradivarius reputedly owned by Mozart, sound the same to him. The nostalgic attachment to his old fiddle is too strong. Deciding that if he has lost his music then there is nothing left to live for, Nasser-Ali climbs into bed and waits to die. As a week passes, we are treated to his mental processes, a tale that encompasses the past and the future, culminating in the revelation of why one particular violin meant so much. Chicken with Plums is the second cinematic collaboration between Marjane Satrapi and Vincent Parronaud, adapting one of Satrapi's graphic novels. Previously, they worked together bringing her story Persepolis to the big screen as a sublime animated feature; for Chicken with Plums, they have decided to go with live action--though a version that carries over some of the same expressive qualities as their cartoon. Using special effects and creative backdrops that mimic Satrapi's art style, they attempt to create a fantastical world of storytelling. Alas, these efforts fall short. The poster declares that the film comes from the producers of Amelie, and the influence is obvious. Too bad Satrapi and Parronaud are no Jean-Pierre Jeunet. The visual aesthetic of Chicken with Plums is actually quite lovely. The intentionally unrealistic backgrounds establish the filmmakers' version of the past as one that is magical and enhanced by how it is remembered. In many sequences, the film looks very much like a comic book come to life, and the figures move through scenery created out of paper and cardboard. Only one of the future fantasies fails to land, an extended riff on American sitcoms that is offensive in its obviousness. On the flipside, the best such digression is the fully animated story about the unpredictability of death, told by the Angel of Death himself (played by Edouard Baer). It made me wish the entirety of Chicken with Plums had been done this way. If Chicken with Plums was animated, then maybe its whimsy wouldn't seem so forced. There is a kind of breathless quality to the film, and throughout, it feels like Satrapi and Parronaud are trying too hard to heighten everything. The effect is something akin to running at top speed into a brick wall. Over and over again, they expend all their energy only to get smashed flat. Even the actors get ground under their wheels. 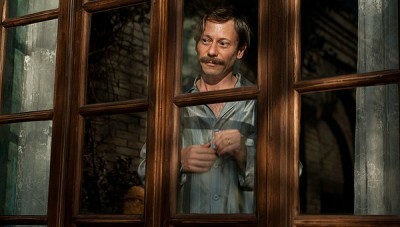 Mathieu Amalric, up until this movie, was someone I thought capable of anything. He just seems lost in the slapstick, eager to please masters who don't know what they want. Likewise, Jamel Debbouze, so charming and so at home as Lucien in Amelie, ends up looking like a hack in his two scenes. He knows where to go, but the directors don't know how to stage the comedic business they've concocted for him. The gag of his hiding amongst the bric-a-brac in his boutique deflates because the directors set it up all wrong and we see the punchline well in advance. All of Chicken with Plums is set-up the wrong way 'round, actually. The heart of the story is the failed romance between Nasser-Ali and the beautiful Iran (Golshifteh Farahani, Body of Lies), but the filmmakers withhold the bulk of this love story until the last 20 minutes of the film. On its own, it makes for a heartbreaking miniature movie, but in terms of the larger narrative, it's too little, too late. The damage has already been done. The less compelling aspects of Chicken with Plums have already caused the movie to fizzle. Buy tickets to "Chicken With Plums" now!